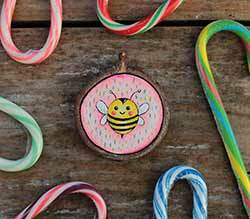 Home decor and gifts featuring dragonflies, bees, ladybugs, and other beloved bugs! Accent pillows, hooks, rugs, table linens, mugs, and more! 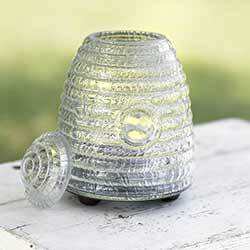 The glass beehive fly trap comes with a metal base and removable lid. 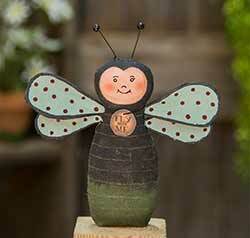 It is a cute way to catch those pesky flying insects. 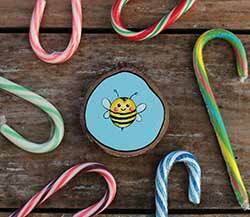 Great for a children's ornament, or for a bee lover, this hand painted bumblebee ornament can be personalized on the front or back with a name or date! 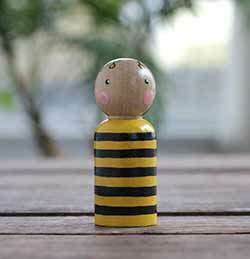 Hand-painted turned wood dolls, great for busy bags, open play, and hours of fun! 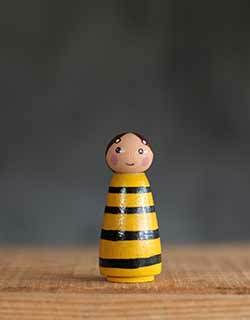 This is painted as a darling black and yellow bee! Cactus Flower Guest Towels, by Tag. 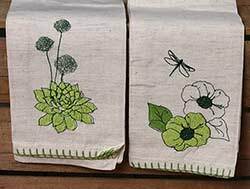 Natural colored cotton guest towels with embroidered green, garden designs and blanket stitched edge. Set of TWO. Guest-sized - Measures 16 x 22 inches. 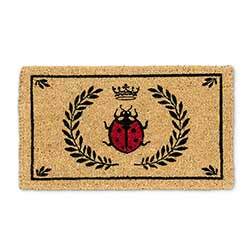 Welcome friends and family to your home with an eye-catching coir mat! 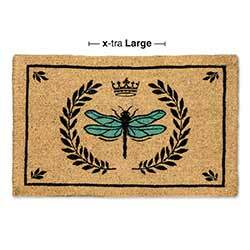 This one features a teal dragonfly image in a crest, against a natural tan background. 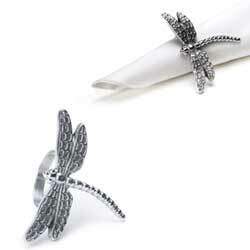 Dragonfly Napkin Ring, by Abbott Collection. Sold individually (priced per ring). Measures 3 inches high. Made of aluminum. Dragonfly Placemat, by Park Designs. The Dragonfly collection features a woven dragonfly design on a medium leaf green background. This is for the Placemat. Measures 13 x 19 inches. 100% cotton. Part of the Enchanted Forest Collection. Rest of the collection also available! Decorate a shelf, desk, or mantel with this green, blue, and black dragonfly doll, with hand painted details and tag that reads "Fly with me." 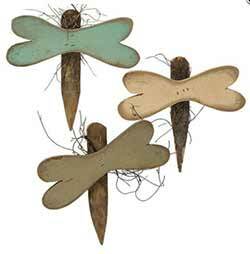 Add a spot of garden charm to your wall for spring with this set of rustic dragonflies, made of rustic wood, and painted moss cream, cream, and turquoise. Five Dragonfly Wall Hook, by the Abbott Collection. If you'll pardon the pun, you'll simply be hooked on this stunning cast iron piece, perfect for completing any space indoors or out. Measures 9 inches long. Features artwork of a ladybug and bee, and read "Don't let the small things bug you," and "All day every day, bee kind!" 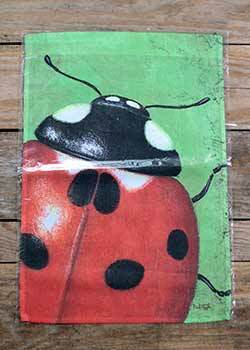 Popular outdoor decor, garden flags are perfect for displaying seasonally! Artwork by David T. Sands. 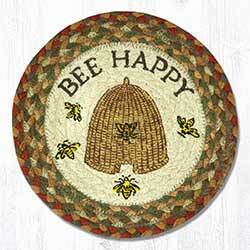 Welcome friends and family to your home with an eye-catching coir mat! This one features a red ladybug image in a crest with laurel leaves and crown, against a natural tan background. 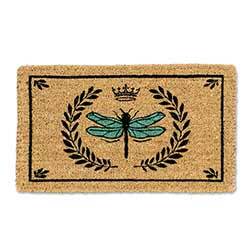 Welcome friends and family to your home with an eye-catching coir mat! 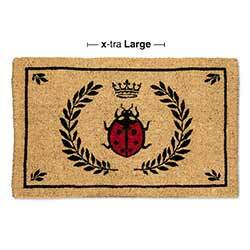 This one is extra large sized, and features a red ladybug image in a crest with laurel leaves and crown, against a natural tan background. 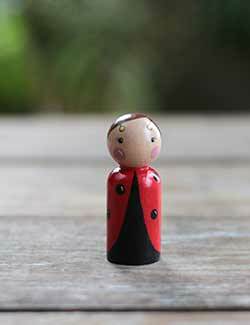 Hand-painted turned wood dolls, great for cake toppers, holiday decor, ornaments, or imaginative play! 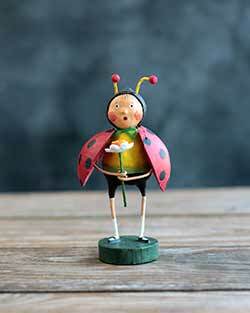 This is painted as a darling black and red ladybug girl! 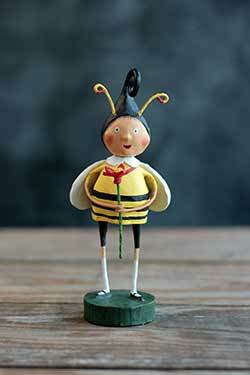 This little kiddo is dressed in a darling bumblebee outfit, complete with yellow and black stripes, white wings, curly cap, and little antennae, and holds a red flower. This little kiddo is dressed in a darling ladybug outfit, complete with red and black polka dots, tiny little antennae, and little white flower. 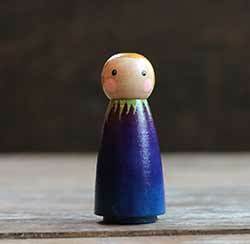 Perfect decor for spring or a fairy garden, this little girl doll is hand painted in watery blues and purples, with iridescent fairy wings.